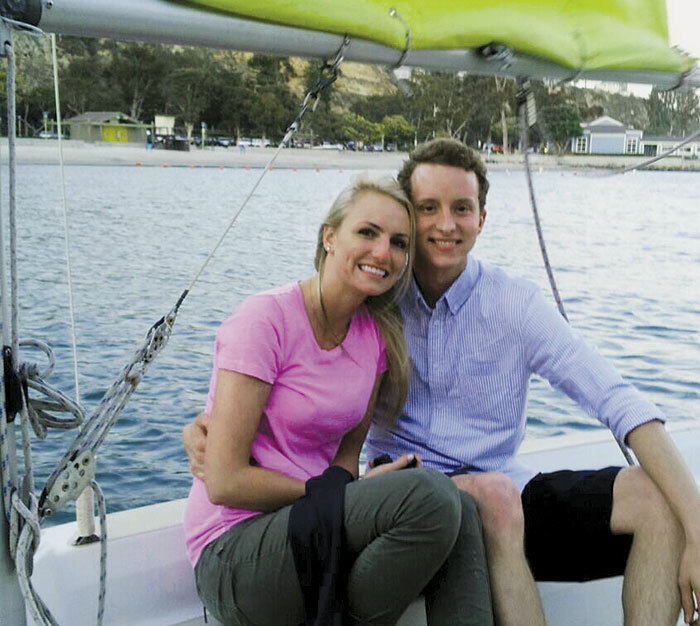 DANA POINT — Sailors in Dana Point Harbor witnessed a memorable marriage proposal when Matt Hadley became Amanda Airmet’s fiance May 13. He cruised up to the dock where his sweetheart was standing, aboard a chartered sailboat. “This was the first marriage proposal we’ve had on our boats,” said Diane Wenzel, executive director of Westwind Sailing. Hadley had flown in from Salt Lake City, Utah to surprise Airmet by popping the question. With the engagement ring hidden in his life jacket, Hadley arranged for his soon-to-be mother-in-law to drive Airmet to Dana Point Harbor, where he was eagerly awaiting their arrival. Airmet was under the impression that the drive through the harbor was intended to help her unwind after spending the day at Disneyland — so, she was very surprised when Hadley sailed up to a dock in the West Basin where Airmet and her mom were standing. With a bouquet of flowers in hand, Hadley asked Airmet to come aboard and set off on their first sail together. The couple sailed around the harbor on a Catalina Capri 14 — a boat similar to ones Airmet had sailed on in Utah. Westward Sailing instructor Chris Fox captained the boat on the windy day, so that the couple could enjoy the ride. This is not Windward’s first time assisting a couple on a memorable day. Last year, staff helped a couple of newlyweds arrive at their reception at Dana Point Yacht Club aboard a stand-up paddleboard. The couple trained with Westward instructors leading up to the big day. Back at the docks, both Airmet and Hadley vowed to return to Westwind Sailing after they are married. The couple plans to wed in the fall at Salt Lake Temple.